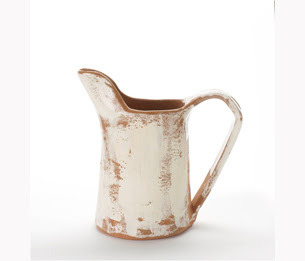 Only three examples of this glazed ceramic Picasso Jug, inspired by the Picasso painting Still Life with Jug and Apple, will be sold in the USA. South African ceramic artist Di Marshall and Mick Haigh were commissioned by Conran to produce a piece that is inspired by objects that inspired the legendary British designer. (That's not too complicated a concept, now is it?) The collection coincides with the publication of the book Terence Conran’s Inspiration. The jug is absolutely my favourite part of the collection. $110 from The Collector's Edition at The Conran Shop.